Sold a Vacant Land home in 2018 in Big Bear Lake, CA. This year is speeding by as we come to the end of July. We started the month off with Fireworks and Chili cook-offs to Concerts at The Cave and Movies in the Meadow. This week brings more fun in the sun with our weekly Farmers Market every Tuesday at the Convention Center from 8:30 am to 1:00 pm. Come see our local and surrounding area vendors. THIS WEEKEND BRINGS MECHANICAL BULL RIDING COMPETITIONS OR FOR THE WINE LOVERS, PAINT AND SIP. Join us for an evening of Painting, Wine Tasting, and fun with new friends! We will be working with Craft to Treasure for our bi-weekly Paint and Sip! The event includes paint instruction, all materials, delicious refreshments, and a glass of wine. Additional wine and merchandise is available for purchase. These events are brought to you by Big Bear Chamber of Commerce! July's newsletter is filled with stats stating that real estate is coming to a "normal" state of supply in Southern California, "Southern California's 'shortage' of existing homes to by seems to have reverted to a more "normal" state of supply. A surge of new listings in the first half of 2018 meant house hunters had 2,402 more listings to consider as June ended than a year ago." The Big Bear real estate market buyer activity continues to remain strong in the $400,000 and under price ranges. We hope that you will consider finding your next vacation home or forever home here with us in Beautiful Big Bear Lake!! July 20th: "80's night" at the Cave!! Follow the link to all the fun in the sun activities here in the BEAR!! This Week in the BEAR! As you know it has been pretty dry up here for a while, however, this week has brought the rains to our community. We are expecting to have rain through Saturday, which is great for our lake and our trees. We have a lot to do up here in beautiful Big Bear Lake and we hope that you make some memories with your family if you are visiting this weekend. I am sure there are more events that you may be interested in and if you click on the link below it will lead you to some great information! If you didn't join us this 4th of July then you missed a magnificent display of Fireworks in the Big Bear Valley. We have so much to do up here in the Bear and we truly hope that you come and enjoy our beautiful mountains for hiking, biking, and boating. We have open houses galore for this weekend as Keller Williams and Mike Dolan & Associates keep the real estate hopping! We hope to see you soon! Click on the link above to see our calendar of events here in the Bear, I do see we have Glo Golfing Second round tonight. See you then! Our Big Bear Chamber of Commerce keeps us up to date on what's happening here in Big Bear and well I am just helping you all out by sharing just a few of the many events we have going on this week! Here is the link to peruse at your convenience. We are hosting our fireworks celebration on Wednesday the 4th, hope you join us! 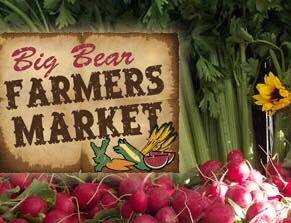 Big Bear Farmers Market features fresh produce, baked goods, arts and crafts and vendors of every kind. Get there early to get the best choice and picks. © Mike Dolan & Associates. All Rights Reserved.